A Shear connector is a steel projection provided on the top flange of steel composite bridge girders to provide necessary shear transfer between the steel girder and composite slab to enable composite action. The most widely used form of shear connector is the headed stud, or shear stud. Other forms of shear connector are block and hoop, and channel connectors. 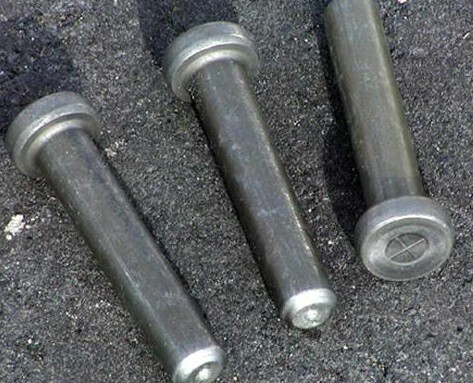 Block and hoop, and channel connectors are typically used where large shear transfers are required, as an alternative to closely spaced shear studs. Shear connectors must be designed to provide static strength, and for fatigue loading. The shear connection needs to be verified at ULS and at SLS limit states. As per Euro code design the requirement at SLS is given in section 6.8.1(3) of EN 1994-2. Respective design codes should be referred for design provisions. It limits the maximum force under the characteristic combination of actions. The SLS limit will usually govern for long span bridges with a high dead load component. Shear flows should be calculated at supports, at mid-span, and at quarter points, in order to plot a shear flow profile along a girder. Shear Connectors or studs are spaced to resist shear at the respective locations. Thus from support to mid-span, the spacing of studs and be varied as per requirements and economy. 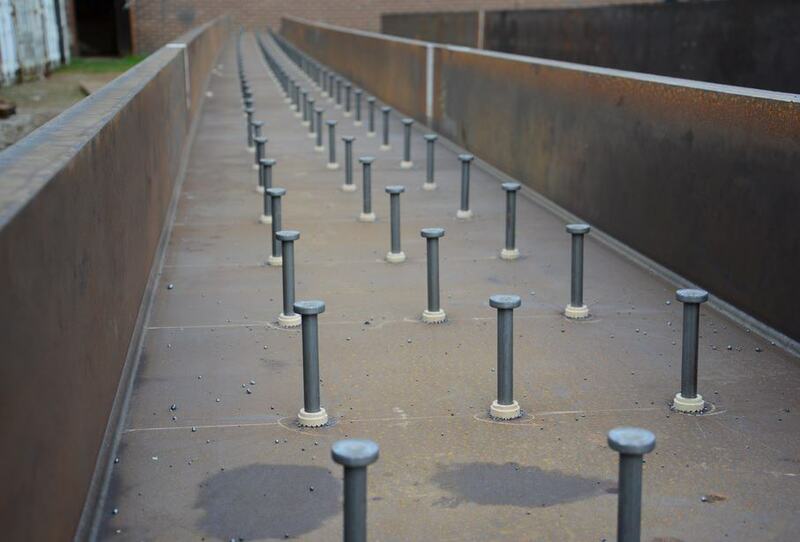 Standard sizes for shear studs, which are readily available from suppliers and typically used in steel composite bridgedecks, are of heights (in mm) 125, 150, 175, 200, 250 and diameters (in mm) 16 19 22 25. Shear studs are generally attached to the top flanges of girders using a welding gun. The stud is held in the welding gun and an arc is struck between stud and the flange plate. Arc melts a portion of both the stud and the plate in a set time. It provides equal shear strength in all directions. Diameter of the shear stud should not exceed 2.5 times the plate thickness in other cases. Underside of the head of shear stud should project at least 30 mm above the bottom transverse reinforcement, thus it govern the height of the stud. The ring test simply involves striking the side of the head of the stud with a 2 kg hammer. Ringing tone after striking indicates good fusion, whereas a dull tone indicates a lack of fusion. All studs are to be checked in this way by the welder or the welder’s mate. The bend test requires the head of a stud to be displaced laterally by approximately 1/4 of its height using a 6 kg hammer. The weld should then be checked for signs of cracking or lack of fusion. The testing rate should be specified by the designer and is usually 1 stud in 50.